When the human survivors of the last nuclear wars could leave their hideouts deep into the ground, they found a sanctuary, the Purple Hill, hidden in the dense jungle. There lived a new race, the Boozooks, peace-loving and wise people. Thinking they were dealing with warriors, the humans savagely destroyed them during the Great Battle. The surviving Boozooks, exploited and oppressed, had to adapt to the situation and learn to live with the humans. At the head of the human government were the President and the Bigwig, his powerful adviser. The Boozook's king and council of Wisemen have turned powerless with the Wisemen suffering from amnesia and having lost their magical powers. 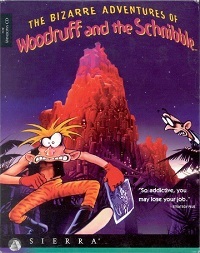 Professor Azimuth however, known for his work on time, is sympathetic to the Boozooks' cause and works hard to end the exploitation. Considered a dissident by the government, Azimuth creates the Schnibble, giving the Boozooks hope for a better future. However, to head off any hope for a revolution, the Bigwig and his thugs storm into Azimuth's house and kidnap him while his adopted infant son Woodruff watches. As a fully-grown Woodruff, and suffering from amnesia, it is your task to find out what happened, recover the Council of Wisemen, free the Boozooks from their oppression and ultimately face the Bigwig himself. 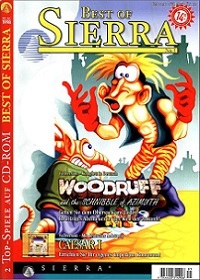 The Bizarre Adventures of Woodruff and the Schnibble, also known as Woodruff an the Schnibble of Azimuth, was among the last adventure games developed by Coktel Vision, using the Gob engine. Developed by Muriel Tramis, Pierre Gilhodes and Stephane Fournier, the game combines traditional inventory items along with a system of Syllables, Formulae and Powers, each which need to be obtained and developed throughout the game. Add a 12-digit strange numbering system, weather manipulation, and a complex plot in the mix, and you get an adventure game which is definitely designed for the more experienced gamer.